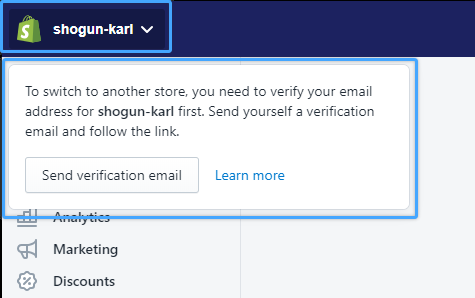 How do I manage Shogun users in Shopify? A list of the users who have access to your Shogun editor can be found in the Settings section of your Shogun dashboard under "Collaborators." 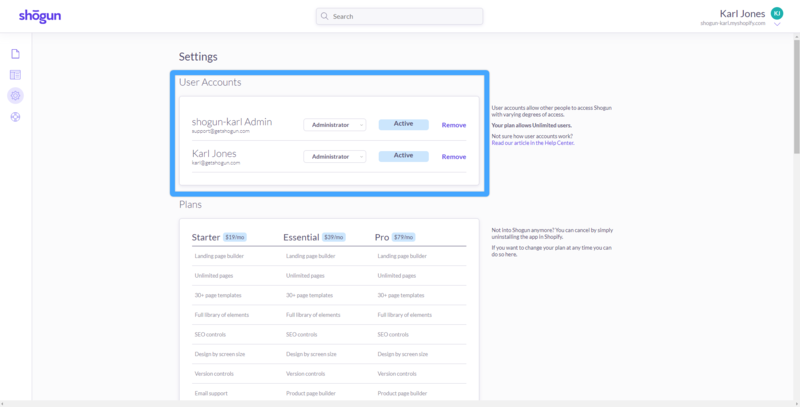 Shogun collaborators can be added by creating User accounts for them in Shopify's dashboard. Users can be given access to Shogun through the Single-Click App permissions. If you would like to revoke the access for any of your collaborators, simply click the "Remove" link next to their name in the Collaborators section in your Shogun settings. If your account has exceeded the number of users for your selected plan, the Store Owner can remove extra collaborators or can upgrade the plan to allow for more users. When an account has exceeded its user limits, the Store Owner will also receive an email notification informing them of these options. My user can not see all of our stores! For security reasons, not all stores will display for a user who has an unverified email address. There are a couple of methods of verifying an email address, the user should follow the steps below. Log into the Shopify store that the user would like to verify. Navigate to the account switched on the upper left of the page.